STEVENSON, Robert Louis, 1850-1894 : VAILIMA LETTERS : BEING CORRESPONDENCE ADDRESSED BY ROBERT LOUIS STEVENSON TO SIDNEY COLVIN. NOVEMBER, 1890 – OCTOBER, 1894. Chicago : Stone & Kimball, 1895. 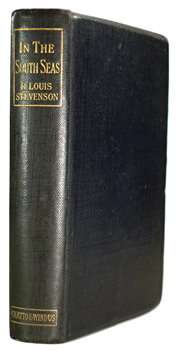 First American edition : possibly preceding the one-volume London edition published by Methuen in November 1895. Letters from the South Seas, with an introduction by Sidney Colvin. Two volumes. Foolscap 8vo (18cm). (282),[ii],; (276),[ii],pp. Frontispieces (one an etched portrait of Stevenson by William Strang). Original green buckram, ruled and lettered in gilt; top edges gilt; just a hint of rubbing; just a touch dulled, but a very good set, housed in a jaunty protective patterned-paper slip-case. Prideaux 42. London : Chatto and Windus, 1900. 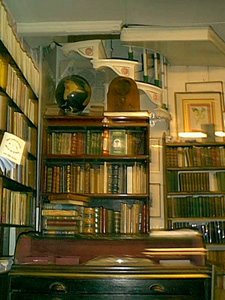 First separate British edition. 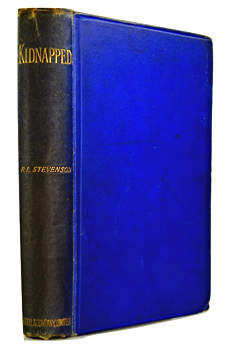 Stevenson’s account of his voyages on the “Casco” and the “Equator” in 1888 and 1889. Although the book had appeared as part of the Edinburgh Edition of the Works in 1896, this was the first separate British appearance of the complete text. Crown 8vo (20cm). (viii),(344)pp. Original black buckram over bevelled boards, ruled and lettered in gilt on spine; top edge gilt; a few slight spots, but a very good copy. Contemporary inscription to Edith Pearson on front free endpaper. Prideaux 30. 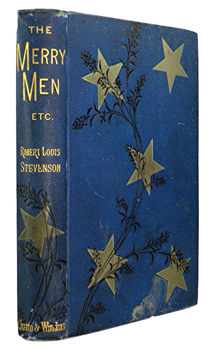 STEVENSON, Robert Louis, 1850-1894 : A CHILD’S GARDEN OF VERSES. London : Bodley Head, 1960. 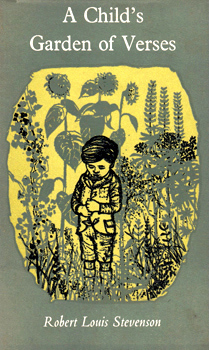 First Leonard Rosoman illustrated edition. A perennial favourite since its first publication in 1895, but here given a complete makeover by the original publishers with over 100 fresh drawings for this edition by Leonard Rosoman. Crown 8vo (20cm). 142,[ii]pp. Numerous illustrations. 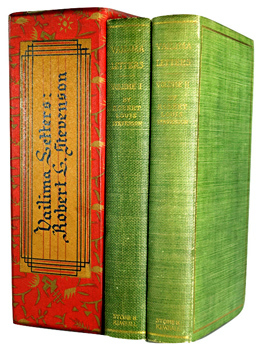 Original green boards, lettered in gilt; some spotting of edges, but a very good copy in the original Rosoman dust-jacket – a design in green, grey and black – just slightly nicked.